Are you searching for an amazing free WordPress themes that you can use for your website? Whether is a business website for your company, a portfolio website to showcase your works, a blog to write on what you are most passionate or an e-commerce store, you can find the best free WordPress theme for your website in this amazing list of 20 best free WordPress themes for 2018. We have also included WooCommerce compatible themes in this list so you can create an e-store on your website. The theme repository of the WordPress.org offers plenty of free themes, but it can quite tie consuming to find out the best theme for your needs. Therefore, we have tested some of the most popular free WordPress themes and picked the best out of them. Some of the themes in this list are not available on the WordPress theme repository. They are taken from other sources. There will be a link to download the theme below the description of the themes which are not available in WordPress.org. The description of each theme in this will contain the following information. You will have picked the free WordPress theme for your website by the end of this post. We hope this list will save your valuable time in figuring out the best theme by trying each one. Note: The free themes may not be completely free. Some themes may be a basic version with limited features and functionalities. You can unlock additional features by purchasing or subscribing to the theme. Remember, you can edit WordPress themes available on the WordPress.org theme repository anyway you want. You can even remove the credit attribution from the theme. Shapely is one of the most used WordPress themes because it is versatile. It is a good option if you are looking to create a business website, portfolio or personal website. The design is very clean and looks stylish. Shapely is an excellent option for those who want a website with a clean layout. It supports WooCommerce, and you can integrate e-commerce if you wish. This is a perfect free theme for beginners as we can build a beautiful website in a couple of hours even if we don’t have technical expertise. Sydney is primarily designed for small businesses. We can change the content and modify the design using the Theme Customizer easily. The front page of the website can be built within an hour if you have all the content ready. The best feature of this theme is its full-screen slider on the home page. You can create additional pages using drag and drop page builders like Elementor. Bento is a premium quality theme available for free. It offers a lot of cool features that most free themes don’t have. You create any kind of layouts using the drag and drop content builder. It also comes with a bunch of templates so you can build web pages in any way you want. The best feature of Bento is its e-commerce possibilities. It is fully compatible with WooCommerce and optimized for e-commerce. Apart from that, Bento has beautiful templates for e-commerce pages which are awesome. You can create a section based one-page website or multi-page website. Bento offers limitless customization. You can create your color combination. The best thing about Bento is that you can do all these things without touching the code. Zerif Lite is another popular free WordPress theme for businesses, and it is a free version of the Zerif theme. This theme is compatible with WooCommerce, and you can create beautiful e-commerce store on your website if you are using the Zerif Lite theme. Apart from that, it offers lots of amazing features and functionalities. It is extremely easy to use, and you can build an entire one-page website using WordPress Theme Customizer. The home page has the following sections. You can modify the content on these sections or hide the sections using the theme customizer very easily. This is one of the best free e-commerce theme available in the WordPress.org theme repository. You can easily set up an e-commerce store with its advanced theme customizer. The functionalities are limited on the free version, but still, you can build a highly sophisticated e-commerce website with this. The creator of this theme provides free forum support which you won’t get in most free themes. 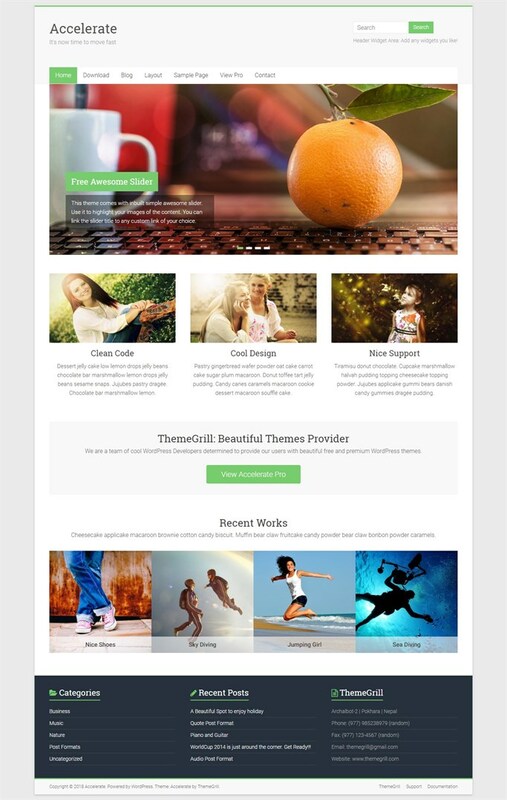 This is a highly customizable and multipurpose theme available for free. You can create business websites, portfolio, e-commerce stores or blogs. Elementor, one of the most famous WordPress page builder plugin, recommends OceanWP due to its powerful features. The best thing about this theme is that you can import demo contents. This helps you to build a demo website with a single click. Then you can customize the content on the website. OceanWP supports WooCommerce, and you can build beautiful e-commerce stores. Unfortunately, we can’t import demo content for an e-commerce website for free now. You will have to build the store like you would do with all other themes in this list. This is a light-weight theme which gives more importance to the performance. However, it doesn’t compromise in style. With Astra Sites plugin, you can find demo websites and import them to your website. This will give you a good start to build your website. Like OceanWP, Astra also works well with Elementor. You can create multiple pages using Elementor Page Builder. The best thing about Astra is that it is stylish, clean, and faster. You can create any kind of website using Astra. This is the best free WordPress theme for content-oriented websites like blogs, online magazines, and news websites. It has a very stylish layout which will help visitors to access the content easily. You should definitely use this website. The full-width carousel slider where you can display latest posts or best posts is also one of the best features of this theme. This theme translation-ready so that you can use it even if your website’s content is not in English. This makes IsleMag a perfect choice for non-English online magazines and news websites. IsleMag provides Google AdSense integration, and you can place ads wherever you want. This will help you to monetize your website more effectively. Hestia is a modern theme which is suitable for small businesses, agencies, professionals, and freelancers. The theme follows latest design principles and has a very clean and neat look. You can create a one-page website with the theme customizer alone. You can use page builders like Beaver Builder or Elementor to create additional pages. You can also integrate beautiful e-commerce store to Hestia theme using the WooCommerce plugin. Their blog and e-commerce pages also have a modern, stylish design. This is another cool free theme from AThemes. This theme is best for small companies, agencies, freelancers, and studios, etc. The unique feature of this theme is the slanted sections. Some of the sections on the front page are not rectangular. This gives the website a distinctive look. The front page has the following sections. The demerit of this website is that its free version doesn’t support WooCommerce plugin. Most companies who would use this theme actually won’t need e-commerce facility, and so it is not a big deal. This is a clean theme for an agency, freelancer or small business. It supports e-commerce so it will help small businesses. It has a very clean design. This theme is very easy to set up. The e-commerce or shop page has a very decent design that would help the visitors to find the products easily. Astrid is easy, simple and looks good. This is a very stylish theme suitable for design or other professional agencies. Small businesses can also use this by removing some sections from the front-page. The front-page has a parallax effect which is really cool, and you can’t find it on most free themes. The front-page also contains a beautiful section for pricing table. This is an excellent theme for agencies that provide services. BeOnePage supports WooCommerce so you can integrate a beautiful e-commerce store to your website if you wish. The layout has dark skin, and it looks stylish with a yellow accent color. This theme is a child theme of the IsleMag theme. You need to install IsleMag before you install ReviewZine. It is primarily created for bloggers who write online review of products, services or anything. It is an awesome free WordPress theme suitable for online magazine and news websites as well. The unique selling point of this theme is that it allows you to rate the products you review on each post. Your visitors can clearly see those rating along with the post title. This theme also has a slider of the posts on the home page. Overall, it is a great theme for magazines and review blogs. This is an excellent free theme for e-commerce websites. You can display different categories in different sections on the homepage. You can also have a video section on the front-page where you can play videos from your YouTube channel or any YouTube video you like. You get premade layouts for all main pages like “About us,” “Contact,” “Shop,” and “Blog.” All you need to do is replace the content with your content. Just above the footer section, it also has a carousel of exclusive products which is a great way to advertise best-selling or exclusive products to the visitors. Auberge is great free WordPress theme for restaurants or cafés. This theme provides most of the features a café or restaurant website should have. You can give the address, opening time and other basic details just below the fold. This helps visitors to find out the essential information they need to know about your café. In the home page, you can provide your menu. You can categories the menu like first courses, main courses, desserts, and drinks. This will create a navigation bar on the top of your menu which will help your visitors to access the types of items they wish easily. You can also add other content types commonly seen in a restaurant website. The free version of Accelerate theme is a good option for blogs. It has a large slider on the top which makes it unique among the free WordPress themes for small blogs. You can consider Accelerate if you are planning a personal blog. Apart from the blog posts, you can also have a portfolio gallery of images on the front page. This is an extremely simple and minimalistic theme for personal or portfolio website. You can add about and portfolio sections on the front page. You can also have separate about and portfolio pages with more content. The contact page has a very simple and clean contact form. 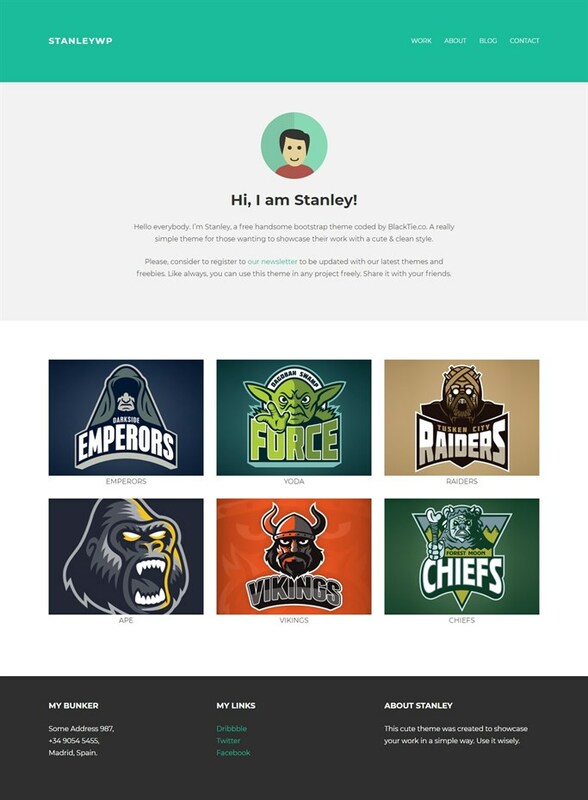 If you are looking for highly minimalistic and simple theme for a portfolio website, you can try StanleyWP. This is another cool theme with a stylish design suitable for personal blogs. The layout of the front page is very simple. The featured image of a post takes half of the width, and the rest contains the title of the post, description of the post, metadata (published date, author, and category). This is a great WordPress theme for any kind of restaurants. You can highlight your exclusive best items on the home page. Apart from that, you can also display a menu based on category. The best thing about this theme is that it has reservation engine which will allow users to book tables based on the availability. This theme has a beautiful design and rich functionalities. It will be the best choice for your restaurant if you allow reservation because many other free themes don’t do that. You can do it by using plugins, but the booking will not immerse well with the website. There are not many free themes with good features for the websites of an educational or academic institution. VW Education Lite can be the best option for a simple website with basic content blocks for such websites. I have tried to include free WordPress themes under all categories. The most demanding ones are business, blog and personal/portfolio themes; therefore, I have picked more of them. I hope this detailed list has helped you to find out the best theme for you. If you have picked a theme and created a website, I would love to see it. Please put a link to your website in the comment below. I would like to suggest one more free theme which is Veriyas. This theme is specially designed for marketing, corporate or professional business websites. It has Custom homepage management, useful shortcodes, drop-down menus, and many more features.